The Men's Short Sleeve Classic Polo from Tru-Spec looks sharp, feels comfortable and preserves a full-range of motion that comes with the demands of active professionals. The sleeves feature snug, rib knit cuffs and gussets, guaranteeing arms are left free. Side vents and the extended back maximize mobility as well as offer secure tucking of the shirt. A reinforced neck yoke provides added durability and prevents damage from backpack straps. 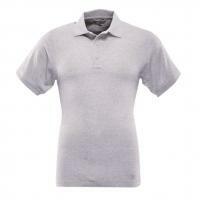 The collar includes stiff No-Curl inserts, preserving the Polo's shape and overall professional appearance. A mic/sunglasses holder is located at the base of the placket, providing a convenient place to fit equipment. Two pen/pencil sleeve pockets offer storage and ready access for writing implements or a pen light.